Pros And Cons Of Hardwood Flooring In Bathrooms? Anytime bathroom renovation ideas are being discussed; it turns out that many homeowners are overly obsessed with their bathroom floors and to a lesser extent the walls. Though bathroom floors can be fitted with materials such as carpets, hardwoods are still a huge favorite and the reason for that is because of the aesthetic value they deliver. Hardwood floors are not short of challenges, and it happens that the main idea that drives their use is the aesthetic preference and not functionality. Homeowners should be well-prepared with the problematic conditions that accompany wood flooring since badly damaged hardwood bathroom floors may be an eyesore which nobody would wish to encounter. That gives an indication that maintaining hardwood floors may force homeowners to part with extra bathroom maintenance costs which may be non-existent in situations where concrete bathroom floors are preferred. Hardwood bathroom floors present many challenges that are not observed in situations when bathrooms are fitted with concrete or carpet floors. For instance, hardwood bathroom floors retain much of the water that falls on them, and consequently, this may create moisturized environments that accelerate mold growth. Hardwood floors at not wholly waterproof, and that mean that considerable amount of water will slowly manage to penetrate and seep into the hardwood structures. 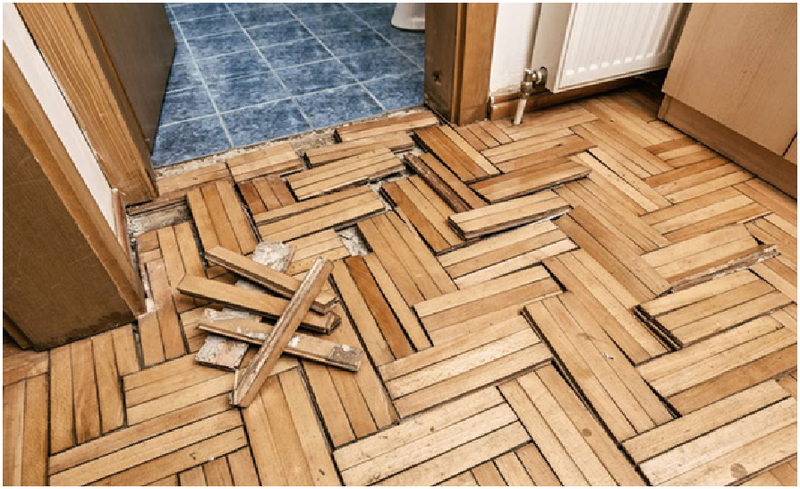 If that is the case, a hardwood floor may slowly but steadily rot from the inside and doing replacements for such damaged bathroom floors often turn out to be so costly. 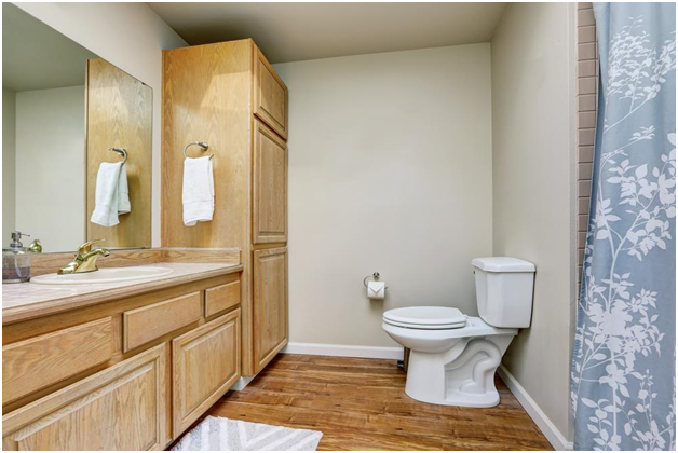 That doesn’t mean that homeowners should shun hardwood bathroom floors. However, they should only opt for them in bathrooms that are less frequently used. Though hardwood materials for bathroom floors are engineered to assume near natural properties that concrete offer; still they can’t fully match the full functionality that concrete gives. It is normal to routinely clean bathrooms so that a premise can gain desirable hygienic standards. Though many chemical detergents for cleaning bathrooms are effective when it comes to inhibiting mold and bacteria growth, their disadvantage is that their continuous use make hardwood floors to appear dull or damaged, and this is due to their corrosive effect. The damage caused by the cleaning agents may cause hardwood floors to lose much of the preferred aesthetic appeal. That means that our choice for bathroom floor material choice should be driven by the desire to enjoy functionality rather than some short-lived aesthetic appeal. What If A Homeowner Insists On Having Bathroom Floors Fitted With Hardwood Material? Hardwood bathroom floors require a lot of maintenance routines, and that is something that can take a toll on homeowners. For instance, something as simple leaking sinks can be a great concern since such water may end up on the on the hardwood material, cause it to expand and slowly create damage to the bathroom floor plan. Many alternatives still exist for persons who may be overly obsessed with hardwood bathroom floors. For instance, wood-like ceramics and tiles can give the aesthetic appeal of hardwood and still offer excellent functionality when it comes to dealing with the excessive presence of water on the bathroom floor surface. 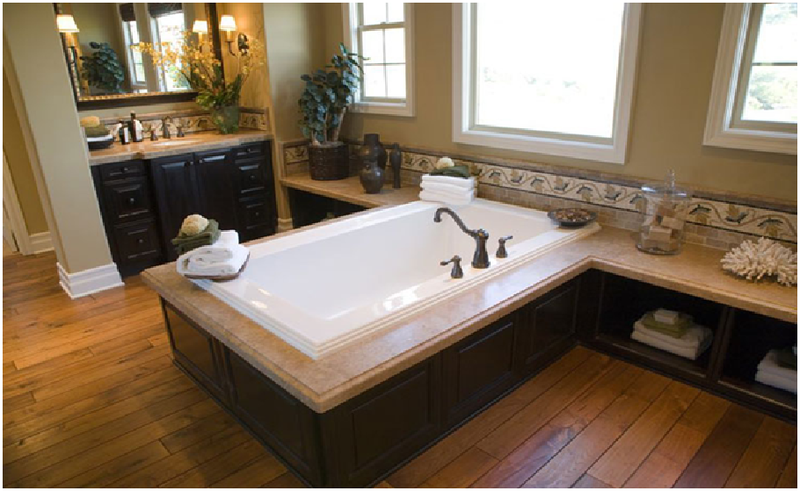 Applying water-resistant resins on the surface of hardwood bathroom floors can also effectively deal with the water issue, and that means that you should choose the best glue for wood. The Final Verdict – Is Wood Flooring In The Bathroom A Good Idea? Yes – but a homeowner will have to be content with the pressures of ever having to worry about bathroom conditions all the time. No matter how responsible you are; showers in the morning and evenings, bathtub spills and overflows, and water splashes will surely give you a headache. Again, it depends on the kind of wood material you may have opted for. Engineered hardwood flooring is preferred because most of its properties have been optimized to withstand the problem of water contact. The exquisite visual appeal that accompanies the use of hardwood flooring comes with a fair price which homeowners must pay. For homeowners who may not be worried about the water contact issue, in that case, hardwood bathroom flooring may be ideal. If you prefer simplicity, then this option may not be feasible.